“Survivor guilt” is the term used to describe the feelings of those who, fortunately, emerge from a disaster, which mortally engulfs others. On an irrational level, these individuals wince at their privileged escape from death’s clutches(Harvery, 2007). “I was confused and did not know what I was doing. I had walked to the enemy lines. Luckily, a team of Special Forces saved me. When they found me, I had dropped my weapon and was wondering towards the enemy lines. I don’t remember how I left my defense point or where I dropped my T56. I was taken to the camp and produced before Col ….. I was heavily questioned. Later they blamed me for abandoning my post and losing the weapon. I was severely punished for that offence”. For nearly nine and half years, he lived his life as a prisoner under the LTTE. He was homesick and practically every day prayed for his freedom. For long time he lived with uncertainty without knowing what his future would be. 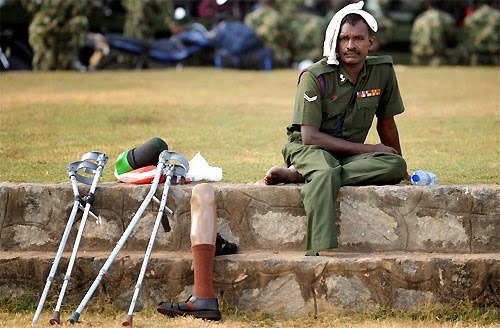 When the Air Force attacked the LTTE camps, their guards used to ill-treat them severely. His condition significantly improved when he met another POW – Capt Boyagoda from the Sri Lanka Navy. Captain Ajith Boyagoda became a POW when his naval ship “Sagarawardene,” was attacked by the Sea Tigers in 1994. Capt Boyagoda gave him courage and strength to face the callous conditions. Along with the other POWs, he spent the time discussing their release and writing letters home via ICRC. For many years, this incident stuck in his mind. He always questioned himself “why didn’t they shoot? With these intrusive thoughts, he re-experienced combat events that occurred in the North. He would have a startle reaction to any loud noise and became vigilant all the time. Despite the posttraumatic features, he was not avoiding combat situations. Therefore, the avoidance feature was not seen in Cpl Tx3. “In 1992 I was posted to Kaytes Island. My own brother served with me in the same unit and I was not comfortable with it. Therefore I requested for a transfer and I was asked to serve in Kajuwatta, Mannar. While I was serving in Kajuwatta camp, one day I got a message saying that my brother was killed in action at Keerimalei. Although I was given leave to attend my brother’s funeral, when I went home the funeral was over. But I attended the religious ceremonies after his funeral. At Mallakam (1995) the LTTE attacked us with RPG. I stood near my commanding officer. I fired at the enemy with my T56, killing two of them, then a mortar exploded near us. I saw my commanding officer wounded and bleeding heavily. His uniform was soaked with blood. I expected help form our buddies. When I looked at the right flank, I saw no one. I shouted for help. Then another mortar exploded near me. I too sustained injuries. Blood came from my left ear. I had no strength to help my commanding officer. While he was lying on the ground I crawled towards the rear side. I had severe guilty feelings for abandoning him on a hostile ground. But I had no option. When I was crawling, I met some of our soldiers. Then I shouted at them “the CO is wounded get him soon” . Finally, I told my fears to one of my unit leaders. He listened to me for a long time and said “you need medical treatment”. So I went to the military hospital seeking salvage. I was referred to the psychiatric unit and treated for nearly three months. I received drug therapy and psychotherapy. My symptoms reduced little by little. Then I felt much easier. Today I am doing light duty. But I have not been completely freed from the Malakam events. Occasionally I see the face of my commanding officer. “That was a horrible event indeed. We went to Jaffna town by a truck. I was in the middle holding my weapon. Suddenly I heard a large noise. The soldiers in front of me fell down. Then I realized that, it was an enemy attack. Despite the ceasefire agreement they attacked us with claymore mines and then with small arms. When the enemy attacked, our driver sustained injuries. But he was able to keep the vehicle stable and we kept on going further. There was a large tyre inside the truck beside which I took cover. While I was lying down two wounded soldiers asked for water from me. But there was no water. We had to travel a few more kilometers to the nearest camp. Another wounded sergeant crawled near me and said something. His mouth was full of blood. Within a minute or two, he became motionless. His eyes were open and he was dead. When the truck entered the nearest camp, I rushed to help the wounded men. Most of them were dead, including the two soldiers who had asked for water. I felt really sorry for them. I could not help these soldiers even to give a cup of water. Sergeant Sx78 served nearly ten years in the operational areas exposed to heavy combat. He faced fierce battle events defending the Jaffna Fort. The Jaffna Fort was under siege and the enemy attacked them with heavy weapons. The operation “Midnight Express” was launched to rescue troops that were trapped inside the Fort. During the confrontation, he killed five of the enemy carders. After some years, he became preoccupied with the thoughts that were related to these killings. Although they came to kill us, they too human beings says Sergeant Sx78. “They were poor village boys like us who had no many options in life. They were indoctrinated, poisoned with hatred and directed to attack us. We had no alternative except firing at them. In a war things are intense, either you or the enemy. If you don’t kill him, he will kill you. Anyhow, these Tamil youths had parents like us, they too had expectations. All ended sadly. Someone, somewhere may be still missing them. I know killing is bad. It is a violation of the first Buddhist precept. I was compelled to do that act”. The war widows face a number of mental health problems. They have suffered bereavement as a result of the violent deaths of their husbands and these traumatic memories hound them for long years. They are often subjected to extreme forms of discrimination and physical, sexual, and mental abuse. Therefore, widowhood represents a form of “social death” for these women. Their plight and vulnerability lead to numerous psychological ailments.